The mezzo, Mariana Paunova, was born near Veliko Turnovo on 13 June 1954. She began her career as a concert pianist receiving her diploma form the State Music Academy in Sofia. An additional diploma was earned at the Warsaw Academy where her teacher was Jan Ekier. She attended the Conservatorio di Santa Cecilia in Rome and the Accademia Chigiana in Siena were she studied with Arturo Benedetti-Michelangelo. She won a Silver Medal at the International Piano Competition in Italy. After joining the piano faculty of McGill University in Canada she began vocal studies with Dina Maria Narici and obtained a Diploma in Vocal Art with Grand Distinction from L'Academie de Musique de Quebec. Many prizes were won in Canada and France. 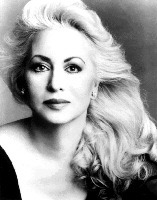 Her debut was singing Pauline in a production of Pique Dame in Charleston, South Carolina in 1977. International appearances were with the Vienna Staatsoper, Teatro San Carlos - Lisbon, Opera del Teatro Municipal - Santiago, Chile, with additional appearances in Rome, South Africa, Puerto Rico and Canada. Her Met. debut in the United States was on 11 April 1979 singing Olga in Eugene Onegin. She appeared again at the Met. in 1986 as Eboli. Additional appearances in the United States included San Francisco, Houston, Philadelphia, Dallas, New Orleans, Washington, DC, San Diego and Baltimore. She experienced a great success as a concert singer appearing with the National Symphony, Cleveland Orchestra, Dallas Symphony, Orchestre National de France, Orchestre Symphonique de Montreal and the Toronto Symphony. Major roles in her career include Dalila, Ulrica, Marina, Marfa, Erda, Laura, Amneris, Eboli, Adalgisa, Carmen, Santuzza and Fricka. Verdi: Don Carlo O don fatale!